Well I definitely crossed over in to true beer geek territory this weekend. Yeah yeah as if the Three Flyods episode didn't convince you of that already. 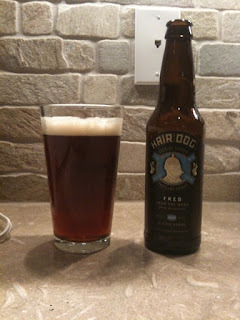 I was invited by my friends to join them at the Annual Hair of the Dog Dock Sale this weekend. It sounded like a great opportunity to check it out and gladly accepted. 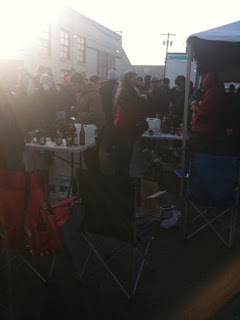 It's basically tailgating except for a brewery release. Great fun but definitely not great for your liver. We showed up at 6:00am and were not the first people there. Keep in mind the sale started at 10:00am. 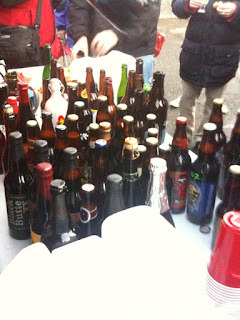 More and more people arrived and a table of world class beer offering appeared. Everyone was free to join in and taste and share. It was a very communal euphoric experience. Sharing special beers with complete strangers that truly appreciate the generosity of each other. It's a commitment to get up that early and brave the elements but the experience is worth it. Now on to the review: One of the rare selections I was able to purchase was the barrel aged, Fred From the Wood. This is dedicated to Beer Writer and Historian Fred Eckhardt. The description of the ingredients are that of a brown ale. The beer is aged for 6 months in new American oak barrels. This means two things: 1 it's going to be complex and interesting, 2 it will get better with age. The beer is clear with a dark amber color and a light head. It has a sweet malty nose with a little hint of hop spice in it. As you drink it, it has a strong ale taste, malty up front with the alcohol overtones. The new American oak is aggresive and it gives it a sharp oak tannin finish. Some additional aging in the bottle will mellow this beer out a bit and increase the complexity. I love the fact that Alan (the brewer) is getting barrels made just for his beer. He's not using whiskey or wine barrels to impart flavor, but using the barrels for the sake of setting up the reactions in the beer itself and helping it's flavor grow and mature. Pros: its a special beer that will grow and develop into something worth enjoying with special friends. Or like minded beer geeks at 6:00am in a dark industrial park. Cons: You have to show up at a dark industrial park in 30 degree weather at 6:00am to get a bottle. Or run in to a fellow beer geek who's happy to share with you.